It’s my first day on the job in my new position. I’m pretty excited but also a wee bit apprehensive. You see, the last guy (who quit Friday, and who was me) did things a certain way. Much of it really, really quality stuff. But I’m not him. I’m the new guy. 1. 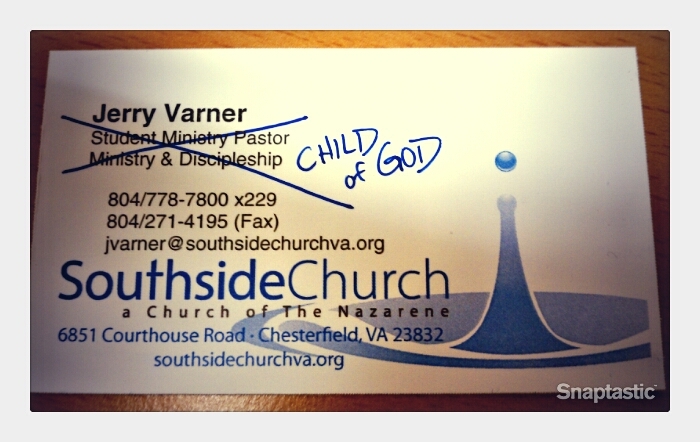 I’m a child of God. I’m not called to youth ministry more than I’m called to simply be in love with Jesus. In the past, I’ve gotten those two mixed up. I polished my professional name-tag as if it were what God cared about; as if it were what He died to bring me. I’m a child of God and student ministry is just the expression of my worship to God, based on how He has gifted me and allowed me to serve students. 2. Since its my first day on the job, I need to look at what the last guy did and ask a few questions like: What was his motivation? What was being accomplished in regards to disciple-making? What needs to be tweaked and what needs to be terminated? 3. I’ve been guilty of deciding for God what He can and can’t do. How stupid is that? Sorry, God. I’m done limiting You. I am who You say I am. You are who You say You are. You can do what You say You can do. 4. Ministry takes a backseat to my wife and 4 children. I will lead, love, and nurture them first. And pray for all parents to do the same. 5. I don’t care if you ever know me, anything I’ve done, written, or said. If you know, love, and follow Jesus, that’s all I care about. Waaay more to digest, dissect, and discover after such a great conference experience and you’ll undoubtedly see things peppered throughout subsequent blog posts in the near future. ← SYMC Blog Entry #3: This one’ll be tough.